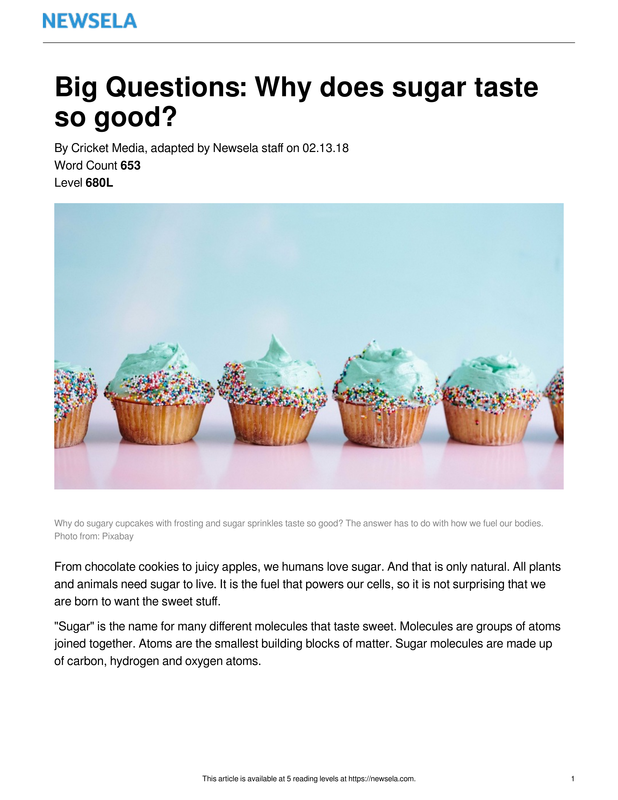 Why Does Sugar Taste So Good? Which of the following atoms make up sugar? Choose all that apply. 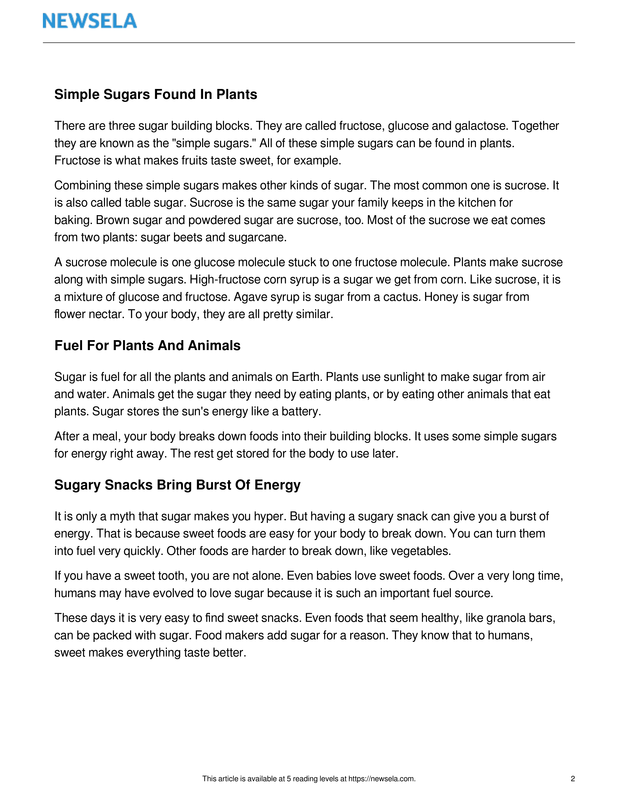 According to the section "Simple Sugars Found in Plants," which of the following is NOT a building block for sugar? What cause does fructose have on fruits? Where does agave syrup come from? "Sugar stores the sun's energy like a battery." What does the author mean by this? Use specific details from the text to support your answer. Why does eating a sugary snack cause you to have a burst of energy? About how much extra sugar to Americans eat every day? Which of the following were listed as negative effects of eating too much sugar? Choose all that apply. 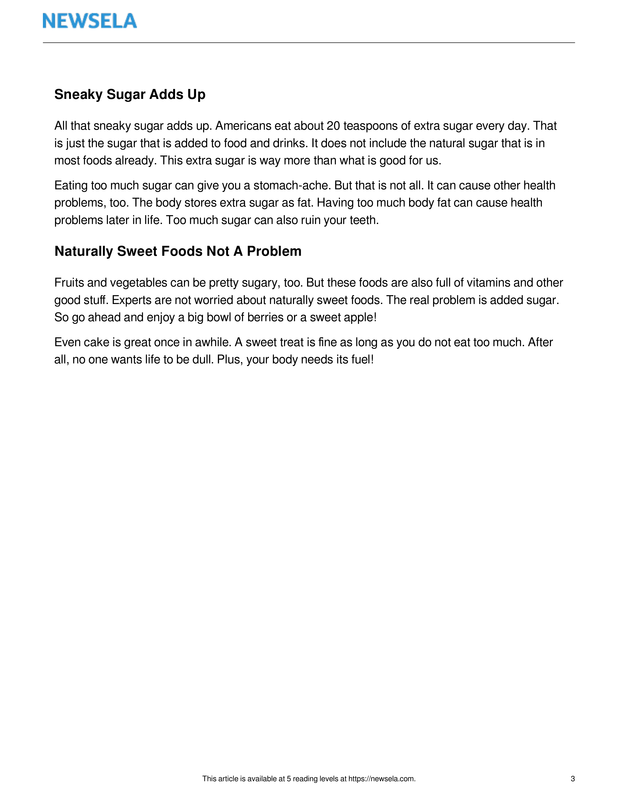 Read the section "Naturally Sweet Foods Not A Problem"
Select the sentence from the section that explains WHY we should eat naturally sweet foods. So go ahead and enjoy a big bowl of berries or a sweet apple! Which sentence BEST supports the idea that humans need to eat sugar? Animals get the sugar they need by eating plants or by eating other animals that eat plants. This article is organized with a cause and effect structure. Which of the following BEST summarizes the cause and effect? Because naturally sweet foods have vitamins, it is okay to eat cake once in a while. Because sugar is tasty and gives energy, people want to eat sugar. Because sugar makes foods taste sweet, people often get stomach aches from eating too much. Because animals need suar to survive, they eat too many fruits and vegetables. One white lined paper please answer the following open response question. Be sure to head your paper with our school heading. Write your answer in your best handwriting, paying close attention to capitals and punctuation. Describe the positive and negative effects of including sugar in your diet. Be sure to use examples from the text to support your own answer, but remember to write your thoughts in your own words.